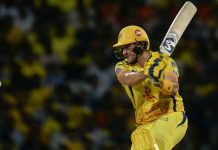 South Africa’s Faf du Plessis smashed an unbeaten 67 to lead Chennai Super Kings into their record seventh Indian Premier League final with a thrilling two-wicket win over Sunrisers Hyderabad on Tuesday. Chasing 140 for victory, Chennai were in a shambles at 62-6 when Du Plessis stepped up with his 42-ball blitz that made the two-time champions achieve their target with five balls to spare in the first qualifier in Mumbai. The Kane Williamson-led Hyderabad, who topped the league table, have a second chance of making the final in the second qualifying match Friday when they will meet the winner of an eliminator. Du Plessis hit five fours and four sixes to propel Chennai, who returned this season after a two-year corruption ban along with Rajasthan Royals, into the final. Three-time trophy holders Mumbai Indians, who bowed out in the league stage, have been involved in four title clashes since the popular league started in 2008. Du Plessis opened the batting with Shane Watson (0) and put on a crucial 27-run unbeaten stand with tailender Shardul Thakur, who made 15 off five balls. “Good to win games like this. But what’s important is to learn out of this game. It’s about constantly improving. This is the best combination that we have got,” skipper Mahendra Singh Dhoni said after the win. “Right from the first game we’ve used different bowlers in different ways to find out who is the best bowler at the end… They will have to step up in the final,” he added. Paceman Dwayne Bravo set up the win with impressive bowling figures of two for 25 to restrict Hyderabad to 139-7. Fast bowler Siddarth Kaul and Afghanistan leg-spinner Rashid Khan then picked up two wickets each to dent Chennai’s chase but Du Plessis absorbed the pressure and finished the game with a six. Khan bowled Dhoni with his trademark googly for nine. Medium-pace bowler Sandeep Sharma also got two wickets. Earlier, 2016 winners Hyderabad — who topped the league table in this edition — faltered after being put into bat first despite a 29-ball unbeaten 43 from Carlos Brathwaite. After losing their openers quickly, skipper Kane Williamson made a 15-ball 24 to lead this season’s IPL batting chart with 685 runs before walking back to the dugout. The 34-year-old Bravo got two important wickets of Shakib Al Hasan and Yusuf Pathan, who was spectacularly caught and bowled by the West Indian allrounder. “It was a decent wicket and we would have liked 20 more (runs),” said Williamson. “Saying that, the game swung back our way, the bowlers were outstanding only didn’t execute (in the death) as we have in the past,” he added of his bowlers who have been excellent in defending low totals throughout season 11. Kolkata Knight Riders will take on Royals in the eliminator on Wednesday in Kolkata. The IPL final is on May 27 at Mumbai’s Wankhede Stadium with $4 million going to the winner.